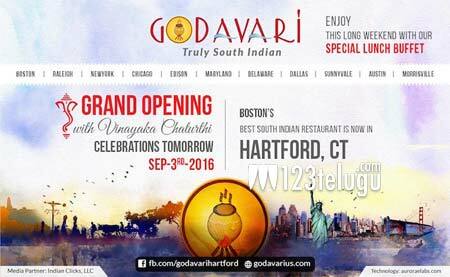 USA, Connecticut, Sept 02nd 2016: Godavari, the fastest growing South Indian restaurant chain is now opening at Hartford CT on September 3, 2016. Godavari Hartford will be the biggest Indian restaurant in entire New England with a banquet facility and bar setup. Commemorating Pushkaras back home in India, the restaurant will have a large 250 Seater banquet facility named “Pushkara”. Besides, there will be two full bar set ups that are uniquely themed as “Godavari Kallu Compound”. First time ever, Godavari is introducing authentic drinks section in a bar set up with attractions named like “Mandapeta Martini”, “Bapatla Bacardi Blast”, “Allam Whiskey” and many interesting drinks with a local flavor. The Mayor of East Hartford will launch Godavari restaurant with a huge lunch buffet called “Godavari lo Mee Istam”. The buffet dishes out signatory items like “Bezawada Bread Vepudu”, “Pakkinti Paalakora Pappu”, “Amala Avakai Koramenu Pulusu”, Seema Kodi Vepudu”, “Bommidayala Pulusu”, “Mamsam Roast Pulao”, “Rayalaseema Raagi Sankati” and many more. The restaurant is conveniently located within a 10 Minute drive from Hartford Downtown that houses a lot of corporate offices and a huge Indian community. Elaborating on the launch Srikanth franchise owner of Hartford said Godavari chain was very excited to serve the Hartford area with authentic Indian food that was currently not available in the neighborhood. “The banquet hall, a large one, will be available for reasonable prices to our community”. Teja Ravella other franchise owner of Hartford, expressed his happiness and excitement to be part of Godavari family which they found very unique with Godavari and their passion and innovation towards making Indian food global. Varun Madisetty, franchise owner of Godavari Chicago, and North East Operations Head, said “Team Godavari” is getting numerous franchise requests and demand to open facilities in several places in the World. “We are working hard as a team to flow Godavari everywhere possible across the globe,” he said. He also added that “Godavari is coming up with great innovations and different concepts to excite the food lovers without forgetting our authentic flavors. Godavari will expand to Rhode Island, Charlotte and Washington D.C next month with plans to launch more restaurants across the globe in the coming months. Godavari chain also invites food lovers and those who love to cook, to send authentic Indian recipes that are currently missing on their menu list. “This helps us enhance the menu list with more authentic Indian varieties, popularize Indian cuisine and serve the community better,” the promoters said. Looking forward to flood Great Hartford Area with authenticity from September 03rd 2016.